Objective: The Health and Nutrition Financing project seeks to improve health and nutrition outcomes for women and children in poor regions of Senegal. Senegal has made significant progress on child health indicators, notably reducing child mortality from 121 to 72 deaths per 1,000 live births between 2005 and 2010. 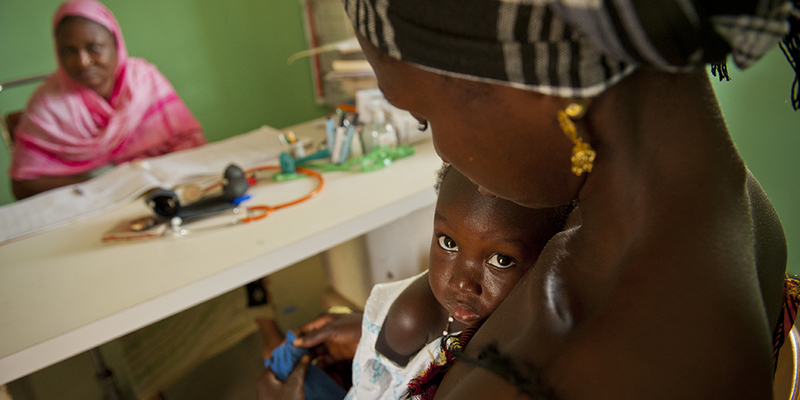 Although Senegal substantially cut chronic malnutrition (i.e. stunting) between 2000 and 2011, results on nutrition are mixed: acute malnutrition (i.e. wasting) continues to stagnate at 10 percent since the 1990s and iron deficiency is widespread. Conversely, maternal health indicators have slightly progressed since 2005, with the maternal mortality ratio only slightly decreasing to about 400 deaths per 100,000 live births in 2011 (DHS, 2011). In addition, while skilled deliveries marginally increased to 65 percent nationwide, only 30 percent of women in the poorest wealth quintile deliver with the assistance of a skilled provider (DHS, 2011) – despite the Government rolling out a program for free maternal health care. Unequally distributed human resources for health, high levels of health workers absenteeism and poor performance, limited financing for health facilities, and the cost of care and transportation constrain both the utilization and the quality of health services – particularly for the poor. The Health and Nutrition Financing Project combines results-based financing (RBF) to increase the utilization and quality of maternal, neonatal and child health and nutrition services, especially among poor households in six regions. The Health and Nutrition Financing Project uses a supply-side performance-based financing (PBF) scheme, under which the Ministry of Health and Social Action (MOHSA) contracts and incentivizes health centers and hospitals to enhance the coverage and quality of key maternal and child health and nutrition services. The MOHSA also signs PBF agreements with district/regional health teams to help create an enabling environment for PBF at health facility level. Quarterly PBF payments are disbursed by the Financial Management Directorate of the MOHSA based on the level of achievement of pre-defined targets and on quality scores. These PBF payments must be used to cover operational costs (i.e. minimum of 25 percent) and to pay individual incentives based on the allocation method defined in the RBF contract (i.e. a maximum of 75 percent). In addition, it also uses a demand-side RBF scheme, under which RBF vouchers are provided to boost timely and complete antenatal care (i.e. ANC+4) and skilled deliveries. These vouchers are provided through RBF health facilities and promoted by existing community structures, the Community Execution Agencies. The ex-ante RBF verification (i.e. prior to payment) is led by an Independent Verification Agent (IVA) contracted by the MOHSA to carry out a quarterly assessment of the quality of care and of the quantity of services delivered. This assessment determines performance levels by combining a quality score derived from a quantified quality checklist, and project outputs extracted from health facility records. Conversely, the ex-post RBF verification (i.e. after payment) is led by community-based organizations (CBOs) contracted by the MOHSA to ensure the reliability of ex-ante performance assessments. Specifically, CBOs counter-verify results by ascertaining that reported services, including RBF vouchers, have indeed been delivered. This process is carried out through regular household visits. The Health and Nutrition Financing Project builds on the pre-piloting of the PBF scheme conducted from 2012 to 2015 in two regions with the support of the USAID. Drawing from the results and lessons learned during this process, the Health and Nutrition Financing project expanded RBF to an additional four regions in 2015. Despite some delays (i.e. recruitment of an IVA and personnel changes), PBF contracts were signed in the summer of 2015 and PBF payments were initiated during the summer of 2016. On the demand-side, a pre-pilot was implemented for a year in two regions prior to being expanded in 2016 to 4 additional regions. The evaluation will be prospective and randomized at district level for supply-side intervention and at facility-level for demand-side intervention to assess the impact of the demand and supply-side RBF interventions – as well as the combination of both. Additionally, the evaluation will assess the impact of use of M-health mechanisms to increase access to care.